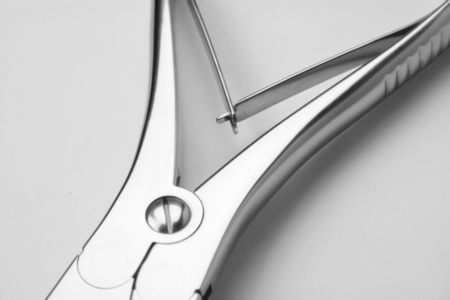 One of Lucideon's global clients manufactures reusable stainless steel orthopaedic instruments. Surface cleanliness is of critical importance – both for safety and aesthetics. On the manufacturing line, the aesthetic appearance of finished goods is an important criteria for acceptance. Instruments that do not meet these criteria – due to discoloration, defects, etc. may be condemned or subjected to rework, leading to increased costs and delays getting to market. Following manufacture, and prior to release, our client’s orthopaedic instruments were developing both yellow and black staining on their surfaces. As the manufacturing process included multiple steps with various contact materials, the root cause of staining could not be discerned without investigation. Lucideon performed a series of surface analyses via Scanning Electron Microscopy with Energy Dispersive X-ray Spectroscopy (SEM/EDS), X-ray Photoelectron Spectroscopy (XPS), and Time-of-Flight Secondary Ion Mass Spectroscopy (ToF-SIMS) to qualitatively and quantitatively identify the composition of the staining. Both on-stain and off-stain analyses were performed for comparison. It was determined that the stain was organic in nature, with elevated phosphate and chloride levels observed within the stained region. Fingerprinting of the major cleaning agents used in the process allowed us to determine a chemical match, and identify the exact contact material still present on the surface. Our Client was then able to identify the steps within their manufacturing process which needed improvement and modification. The client was able to quickly identify the cause of the staining in a very complex manufacturing process. This then allowed corrective actions to be quickly implemented to prevent this staining from happening in the future. Lucideon's expertise and comprehensive surface analysis offering allowed for the stain to be identified and immediately matched to a specific contact material within our Client's existing processing.